At the Bakers Arms we have a pretty top notch little team of experienced chefs, delivering some seriously delicious plates of food. Overseen by head honcho Adam whose culinary CV is impressive in itself, our aim is to cook food that makes you smile because it looks great, tastes even better and satisfies both discerning palettes and big appetites. We update the menu at the Bakers Arms regularly, honing and improving some recipes and dishes, whilst replacing others with new ideas or seasonal specials, and our newest menu is better than ever. We’re dedicated supporters of a myriad of local producers, so this new menu is, as always, scattered with seasonal, super fresh, locally sourced ingredients. It’s not just the standard stuff either. Our shopping list includes such gems as nasturtium leaves, figs, gremolata, Devon crab and hangar steak. Yum. It’s fair to say that our latest menu certainly gives you plenty of choice. If you fancy a light lunch there are soups and salads to choose from, our signature filled baguettes with Bakers ‘slaw and some small-yet-perfectly-formed main meals. Opt for watercress soup (with local ‘cress of course), a fabulously fresh salad bowl with Isle of Wight tomatoes and Chalk Stream trout or grab one of our classic caesar granary baguettes. For a lunch that’s just a little more filling our pulled pork chilli, pan fried liver or one of our tasty pasta dishes are hard to beat. If the sun’s out you can enjoy our sun-trap of a terrace (and you can always dash indoors if the heaven’s open). One of the things we’re really keen on providing at our Droxford pub is a relaxed home-from-home environment (without the washing up). A perfect place for popping in mid week, after work with friends or family. For having a couple of drinks or a great quality glass of wine, a good old chin wag and a bite to eat - without feeling under any kind of pressure. If this sounds good to you, our bar snacks and sides selection could be right up your street too. Order a plethora of dishes such as our tapenade with croutons, sweet potato fries or mozzarella and tomatoes and we’ll keep them coming whilst you make the most of a little bit of time out. For something a little more hearty, celebratory or a bit special, why not book up for a full-on, slap-up supper? Whether it’s a weekday wind-down or a weekend knees-up, you’ll definitely find three-courses to savour and an atmosphere perfectly suited to socialising. We can provide an intimate table for two or a generous space for a group - just let us know what you need in order for your evening to go with a swing. 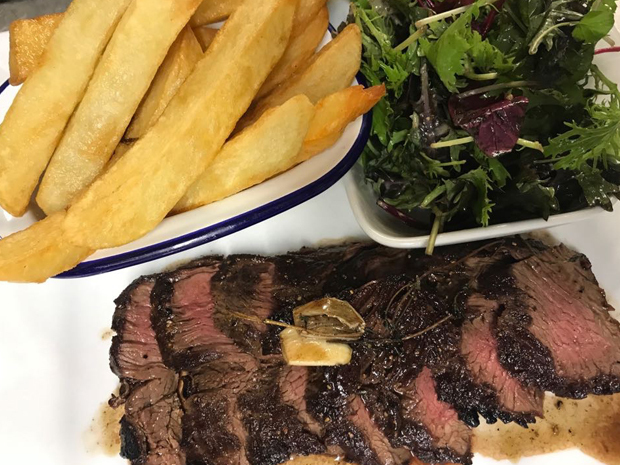 Choose from our mouthwatering steaks, cooked just as you like them, melt-in the mouth lamb shoulder, beautifully fresh fish of the day or our delicious sweet potato rosti with our own caponata. Whether you’re gluten-free, veggie, vegan, carnivorous or just plain gluttonous, we’re pretty confident we’ll have something to catch your eye and which you’ll think is suitably special. We’ve not forgotten the little ones either. Our ‘Smaller Beings’ menu caters for the pickiest eaters and ensures there’s a tick in both the ‘delicious’ and ‘nutritious’ boxes… Even better, if you come along to the Bakers Arms in the week and order before 6.30pm, every child with an an adult eating a full main course gets their meal half price. That means they can have 2 courses for just a fiver. Bargain. If you’ve got a sweet tooth then at the Bakers Arms, you’re in for a treat. Lemon posset, crumble, Eton Mess and fudge brownie… all the classics, created with care and the best ingredients. We always have a good selection for ice cream addicts, as well as refreshing sorbets and Hampshire cheeses if they’re more your preferred ‘afters’. Rest assured that on the drinks menu at the Bakers Arms, you’ll always find a very comprehensive selection of whistle whetters and thirst quenchers. Craft ales, draft lagers and excellent bottled beers galore, not to mention our speciality single malts, brandies and ports. As well as locally brewed ale and excellent wines, we’re championing a fabulously fragrant gin made with rock samphire from Cornish mixologists, Curio and a quirky locally produced tomato juice made from IOW toms. If you’re the designated driver then you’re spoilt for choice too because we stock Bottlegreen elderflower, Fentimans lemonade and Hill Farm apple juice from just up the road. And we’ve saved the best ’til last. Our whistle stop tour of the Bakers Arms menu concludes with a reminder about our award winning Sunday Roast. Famed for it’s generous size, fabulous array of vegetables and the option to have pork, beef and chicken (if you can’t decide on just one). We always have a vegetarian choice too and right now you can also enjoy our summery Crab Thermidor and Caesar Salad on Sundays too. So we hope you’ll pop by and try out our ‘even-better-than-ever’ menu soon. Give us a buzz to book a table or book via our handy online system so we know to expect you and we’ll try our very best to make it all brilliant.